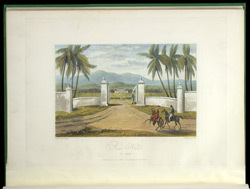 This print of the imposing gateway to Rose Hall in St James' is taken from James Hakewill's 'A Picturesque Tour in the Island of Jamaica.' The Hall, erected between 1770 and 1780 by John Palmer at a cost of £30,000, was regarded as the greatest house ever built in Jamaica. It was laid out in the style of an Italian villa, and was situated on a hill with a view of the sea. A double flight of stairs led up to an open portico, and within was a grand entrance hall leading to dining and drawing rooms. The Hall had two wings: one housing the elegant public rooms and the other, the private quarters of the owners.